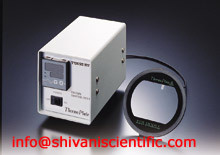 heating device, which allows strict temperature control of the specimen from directly beneath during microscopic observation. Wide efficient area ThermoPlate is a clear glass heating device, which allows strict temperature control of specimens from directly beneath, wherever they are placed on the heated surface. By combining ThermoPlate with microscope mechanical stage, multiple specimens simultaneously heated on the plate surface can be observed efficiently without relocation. Quick Start up ThermoPlate is a aclear glass heating device, and because it is so responsive, the whole heated surface achieves the set temperature very quickly. Place your mouse on the keyword for details. It is also compatible with Nikon, Olympus, Leica & Zeiss.